By Ian Aldous: Following his unfortunate November 24th defeat to the unbeaten, Fanlong Meng, due to a cut – Frank Buglioni (22-4-1) decided to call it a day and hang up his gloves. The announcement, posted on his twitter account, drew an outpouring of love from the entire boxing community. Former opponents, promoters and fans alike proclaimed their respect for a man who left everything in the ring and no stone unturned in the gym. Just prior to Christmas, Frank took a little time to chat with me over the phone to reflect on his career. IA: The decision to retire was made very quickly after the fight with Meng. Did you have a ‘win or bust’ mentality going in to it? FB: I’ve never had that mentality. Going into my fights, I’ve always just done my utmost and never put any undue pressure on myself like saying, ‘this is my make-or-break fight’. But when I look back, I think it was a make-or-break fight. In hindsight, that’s what I see it as, but I didn’t have that attitude going into the fight. IA: Meng is a former Olympian and an unbeaten pro. I’m sure you could have taken an easier opponent, but was that not something you were motivated to do? FB: I’m in boxing to fight the good fighters and I wanted to be a world champion. Getting to world level is not an easy ride. If you’re nervous about fighting those sort of guys, then you know that you’re not going to make it to the top level. So, for me, it was the right fight and the right decision. I felt I had the beating of him and I still believe that I had the beating of him. It’s just unfortunate timing and (I) got caught with the cut. It’s not because I was the lesser boxer. I’m susceptible to cuts and there’s a weakness there. IA: There was a big outpouring of love from former opponents like Ricky Summers and Callum Johnson after you announced your retirement. Were you a little shocked? FB: I was a little bit, yeah. Do you know what – I’ve made so many good friends over the years. I’ve tried to treat people how I like to be treated myself and I’ve always gone by that mantra. If people are nice to me – I’ll be very nice to them, and if they’re horrible to me – I’ll be very horrible to them. I’ve had a good time in boxing and met some great people. IA: What do you look back on as your career highlight? FB: It’s got to be the (Hosea) Burton win, winning the British title in his backyard and the way I did (it). It was one for the history books. IA: Who was the best opponent you faced? FB: I’ve probably got to say Callum Johnson and I’ll give credit to Joe Gallagher for the tactics. IA: The loss to Callum Johnson stopped your momentum after beating three undefeated guys on the spin, what happened that night? It was a shock to me. FB: He caught me cold and early with a shot high on top of the head that scrambled my senses and I didn’t really recover in time. He caught me on the chin and there was a head clash again. 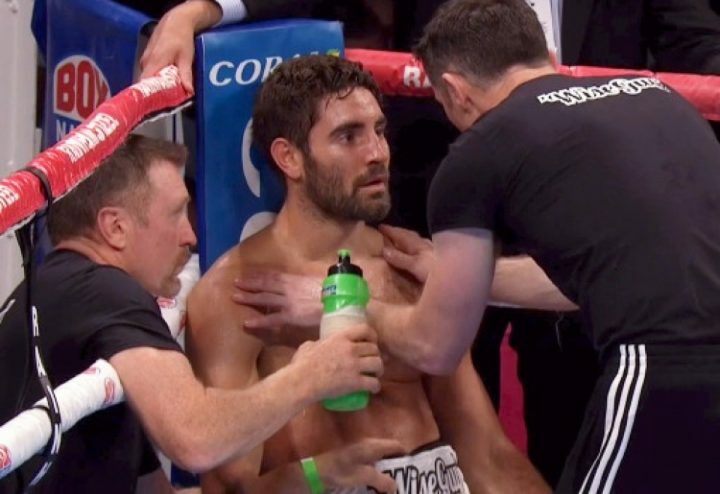 Listen, I’d loved to have carried on and I’m sure, had I made it to the end of the round, I would have recovered and boxed a little bit differently. We saw what Callum did to (Artur) Beterbiev, he dropped him heavy and if he realized how hard he hit him and how heavily he dropped him – I think he could have jumped on him and become world champion. No shame in that defeat. IA: Are there any fights that you regret missing out on that didn’t happen. FB: Yeah, the (Anthony) Yarde fight was certainly one that I was interested in. But, overall – no regrets. I’ve had a good career and I’m excited for the next stage in my life now. I’m excited for the future. IA: We all know sports careers don’t last forever – have you been preparing for life after boxing? FB: I hadn’t been really, no. I’ll give 100% effort into the next chapter in my life. I think as long as you apply the same winning mentality to your different careers, then you’re OK.
IA: What do you intend on doing now? FB: I’ve joined the family construction business and I’ll be going in as a managing director and surveyor. (I’m) carrying on with studying as well. IA: Is there no fight out there that could potentially change your mind and bring you out of retirement? FB: If they want to give me a million pounds to fight a lightweight then I’m sure I can come out of retirement for that (laughs). I’m waking up in the morning with energy and no marks on my face. I’ve got no bruises on my knuckles and my hands, no sore back. I’ve got energy and I’ve got enthusiasm for different things and I’m happy where I am. IA: How would you like fans to remember you as an in-ring competitor? FB: I’d like them to remember me as someone who gave it my all and I applied myself to the best of my ability in training camp and then when I got in the ring and fought. IA: What are Christmas plans for the ‘Wise Guy’? FB: I probably won’t be taking too much time off, but I’ll have a nice Christmas Day and Boxing Day with my girlfriend and her family. My family are booked to go skiing and obviously being a professional boxer at the time – I had to swerve that like I have done for the last few years. I can’t risk injuries. I’ve missed out on that, but I’m sure in the future I’ll be on those holidays with them. IA: I’m sure you’re fed up with hearing it, but it’s been great following your career and your British title reign is in the history books now. FB: A lot of people are saying, ‘you’ve still got more to give’, do you know what – I have got more to give, but I don’t want to give my health and all my energy to boxing because I’d resent it then if I came away not in full health. I don’t want to resent boxing. I want to have that love that I’ve still got for it and had all the way through my career. I’m leaving it in a good place. I’m proud of my achievements.